Working in an EMC test lab means I get to see all kinds of equipment. No two devices are ever the same so I have to make up / adapt cables to interface various devices. If you work with a wide range of products or just want a bit more versatility in your lab then read on. I have no affiliation to any of these products, I just use them a lot. 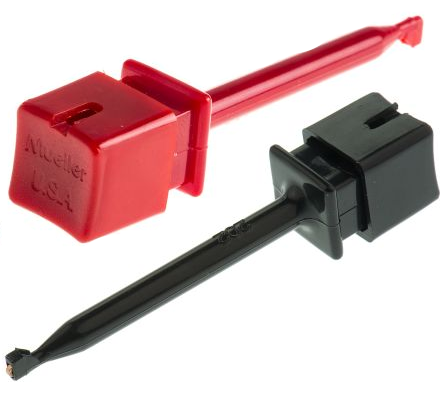 These versatile little test adapters from Clever Little Boxes are great for being able to quickly hook up one thing to another. As you can see they come in all shapes and sizes. I’ve got a box full of various ones, including the ones shown in the above photo. 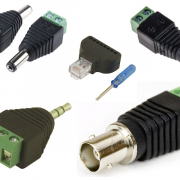 The ubiquitous 4mm “banana” plug and socket is super common on power supplies and other kinds of test equipment. They give a surprisingly low resistance connection for their size which, along with their simplicity, goes a long way to explaining their popularity. If you’ve ever made up a cable assembly with standard connectors then you know they can be a pain. 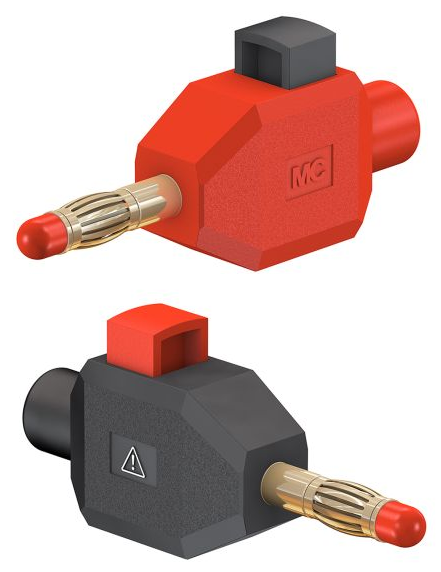 That’s why I really like these connectors that have a spring loaded gate that accepts a bare wire up to 2.5mm^2. 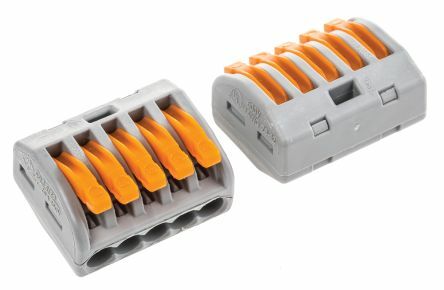 I really like to pair these crocodile clips with the 4mm connectors above for super versatile connections to anything big like metal frames or enclosures of equipment. 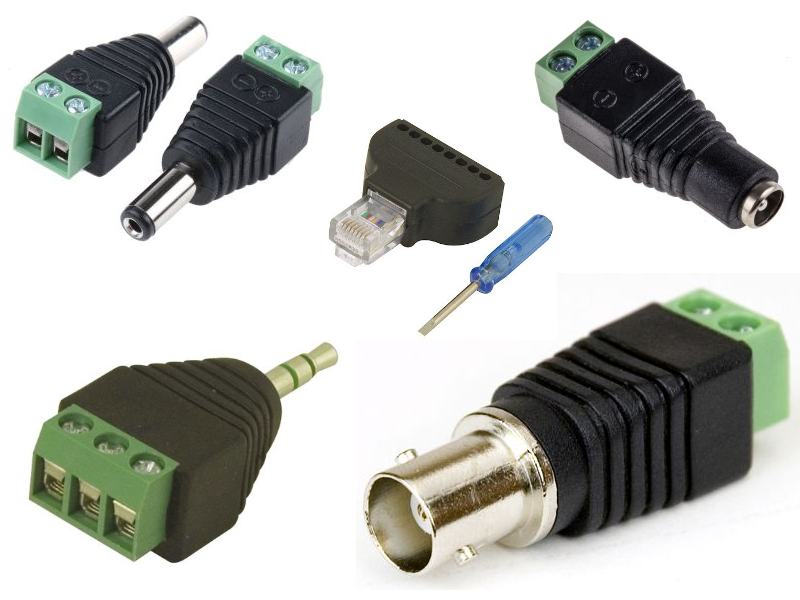 Big numb adapters get a bit crowded when trying to connect onto individual connector pins or component legs. That’s where these teeny spring clips come in. I’ve often ended up with one of my development boards looking like an electronic porcupine with these stuck all over them! Something More Permanent for Sir? 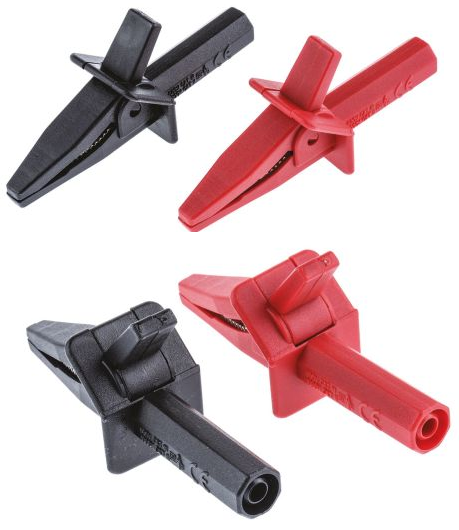 If I’m wiring up anything using mains voltages that I want to be a bit more permanent and safe then my go to are these spring terminal blocks from Wago. They are like choc block terminal strips with the main exception that these are not rubbish. Rated at 32A they can accept much larger wires that you would think and the spring clips retain the wires with a remorseless grip. They come in multiple ways although I tend to use 2, 3 and 5 by default. Best of all they are ridiculously cheap. Just don’t get your thumbnail caught underneath the orange lever when it clicks down otherwise you’ll be using some language that is distinctly NSFW. So “be prepared” (Scout motto) and happy testing. p.s. don’t get me started on the adaptor vs adapter debate. 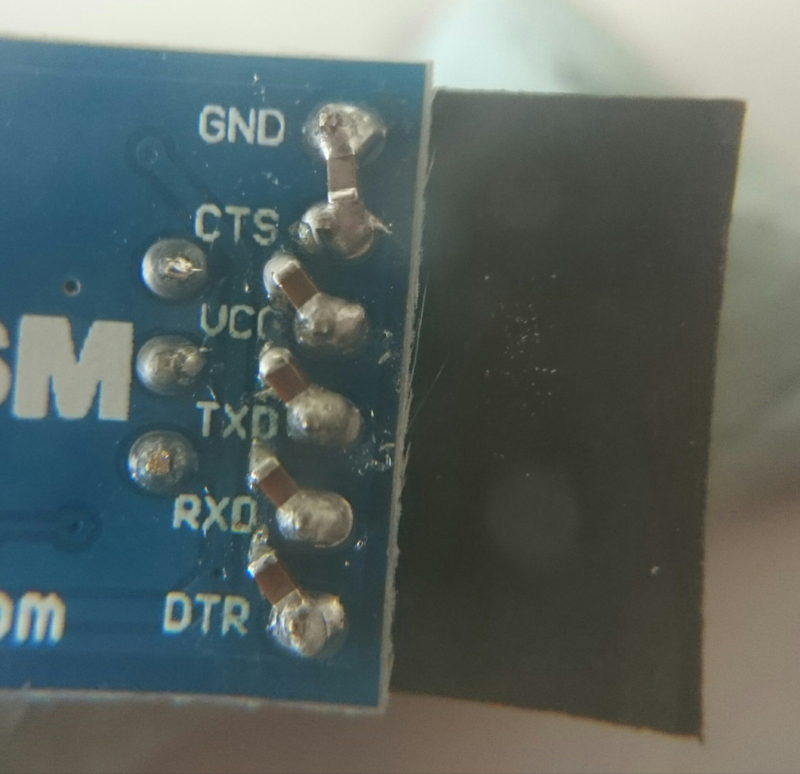 A while ago, I wrote about EMC immunity problems with USB to serial converters and how it was easy to fix with a small 100pF capacitor to ground on the TXD and RXD lines for a bit of filtering. Well, now I’ve found the opposite problem of EMC radiated emissions failures caused by these periodically problematic products. In this case it appears to be harmonics of the 48MHz internal clock of a SiLabs CP2102 being conducted out of the converter on the TXD and RXD pins. These little boards are generally used as development tools in a laboratory setting but there’s nothing to stop this IC or module being integrated into a product where these problems would manifest themselves. 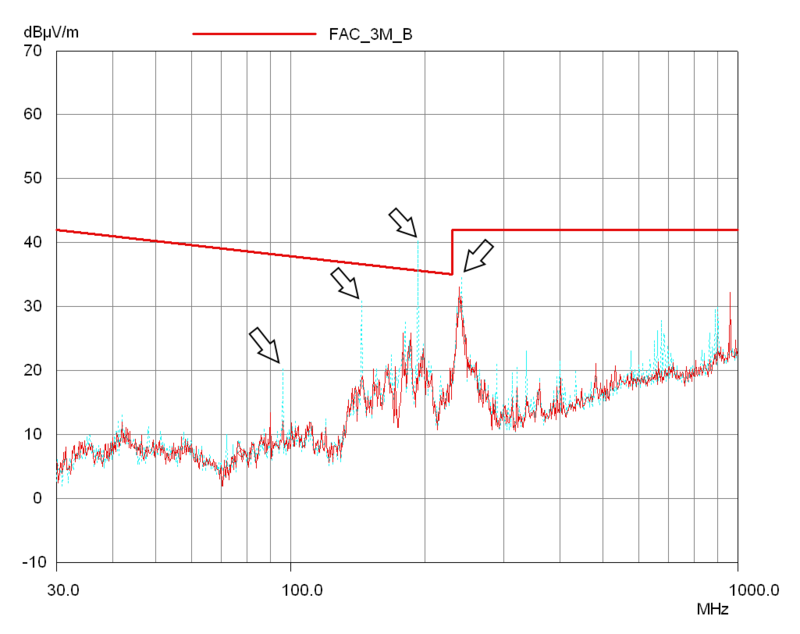 The below plot shows the radiated emissionsbefore (light blue) and after (red). This module was connected to it’s host by 10cm unshielded wires, not an unreasonable application by any means. I’ve been working on a power supply product for a customer with a very tight limit on the AC mains fuse rating. 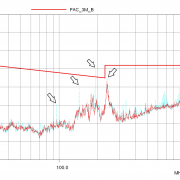 One of the problems this causes is during differential mode surge testing. When the metal oxide varistor (MOV) connected line-to-line fired, the resulting current was enough to blow the fuse after a couple of surges at the specified 1kV surge (1.2/50us, 2 ohm). Clearly there wasn’t enough headroom for the product to pass the test. 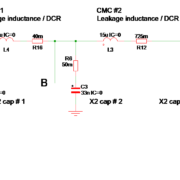 A different MOV with a higher clamping voltage would have reduced the peak current but at the cost of higher voltage stress elsewhere in the circuit. I decided to look at if the position of the varistor within the circuit made a difference to the surge current in the fuse. It started off in the middle of the mains filter (PCB routing convenience I suspect) but perhaps mounting it before the filters would help? What about at the end of the filter chain, then the X2 capacitors can go to work on the surge pulse first. The easiest way to try these scenarios was to stick it into SPICE (I like SiMetrix) and have a look at the variables. I crudely modelled the input stage of the power supply as shown below. I guessed at many of the series impedances for the fuse and the capacitor. However the leakage inductances and DCR for the inductors I measured using my excellent Peak Electronics LCR45 component meter. The MOV was simply a 1N4004 diode with a 400V reverse breakdown and the surge was only applied in the +ve direction. I varied the position of the “MOV” between positions A, B and C to see if there was a difference in the surge current through the fuse (R15). Interestingly enough, there was. 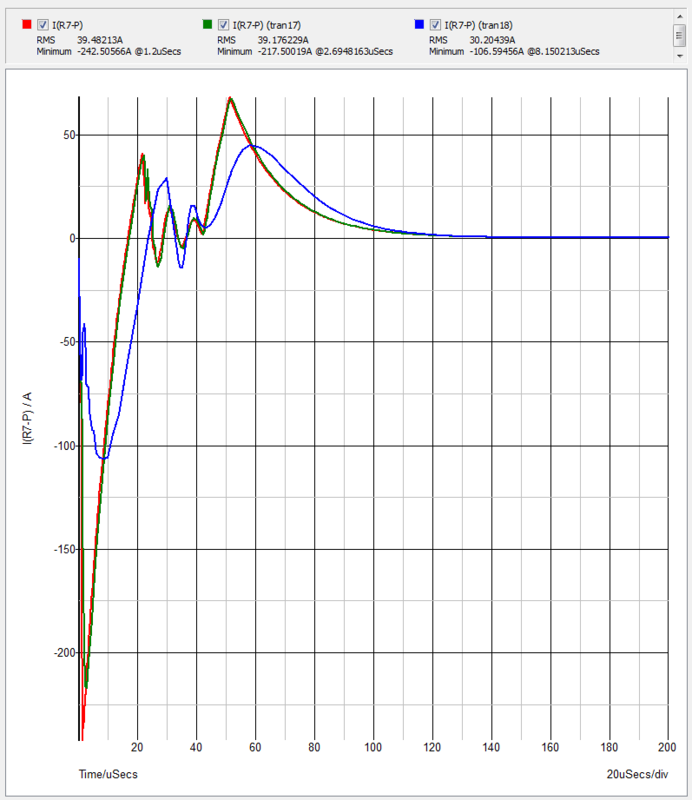 So the further down the filter chain that the MOV is placed, the less the peak surge current (56% lower) and the RMS current (23% lower) through the fuse. The results were positive too. The power supply went from failing on the 5th strike at 1kV to passing 10 strikes at 1.75kV. A marked improvement resulting in a more robust product. Answer: When you don’t read the standard properly! I was verifying my EN 61000-4-6 conducted RF immunity test setup after the construction of some new test adaptors and acquisition of some new equipment when came across something that left me scratching my head. I figured it out eventually and updated my calibration procedure with a note but it did have me puzzled for an hour! Like most conducted immunity signal generators, the one I use combines a signal generator and modulator with a power amplifier and some front panel controls/readouts for performing the basic functions. It also has an RF Input for calibrating Coupling/Decoupling Networks (CDNs) which measures the voltage at the 150/50 ohm calibration adaptor and sets the output voltage of the generator to the correct level. My generator has a LED bargraph display showing the level which provides a reassuring visual confirmation that everything is OK.
Having calibrated my new CDN at 3V, since I had a scope within reach, I decided to run the test but monitor the output of the calibration adaptor with the scope to make sure it was all working OK. I did not see the expected 3V level, instead the RMS measurement on the scope was 0.5V and the pk-pk was just over 1.5V. I checked my 50 ohm thru termination on the scope input and even swapped it for a different one. My second scope also read the same voltage so it clearly wasn’t the scope. Puzzling. I swapped the CDN for one that had been previously calibrated CDN and the lower than expected output voltage persists. Try turning up the generator voltage to 10V and I can’t even achieve 3V on the scope. Yet when I swap the connection from the scope to the RF generator it proclaims that yes, that is indeed the level that the generator says it is outputting. Putting a BNC T-piece in series and monitoring the voltage with the RF input terminating the signal still achieves the same result. Is the generator RF input broken and reading the wrong voltage? EN 61000-4-6 specifies the test levels in terms of Uo, open circuit voltage. However the generator level setting part of the calibration is based on a measurement of Umr, the measured output voltage. This is a slightly simplified version of Figure 9 from the 2014 version of the standard showing the impedances of each part of the system. Tucked away at the bottom of the calibration section is the formula that links the two together. For the measurement, the impedance of the decoupling part of the CDN is big enough that the termination of the AE port is not significant to the measurement, making most of the current flow through the EUT port network. You should be able to open or short the 150 ohm AE port termination and not see the measured output voltage change significantly. 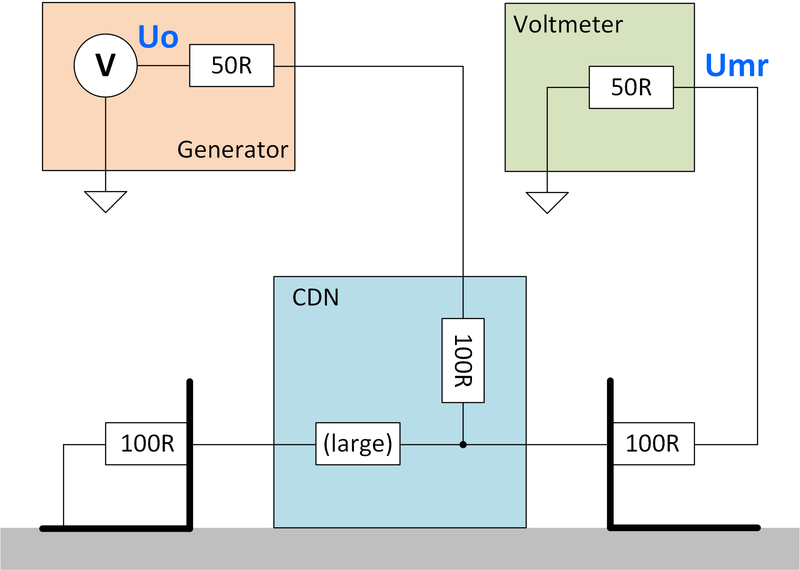 By simplifying the above image and a bit of Ohms law you can clearly see that Umr is 1/6 of Uo. Which when added to the above table makes life a bit easier. Armed with this new knowledge I revisited my calibrations to find that yes, everything was measuring correctly. The RF generator, being designed specifically for conducted RF immunity testing, takes care of the divide by 6 in it’s calculations. As an ex-colleague was often heard to remark “every day is a school day” and today’s lesson was a good one. 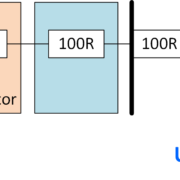 I hope this article saves you a bit of head scratching next time you are verifying your conducted RF immunity test setup. https://www.unit3compliance.co.uk/wordpress/wp-content/uploads/2018/03/cond_rf_imm_uo_umr_2.png 613 1610 James Pawson http://www.unit3compliance.co.uk/wordpress/wp-content/uploads/2017/01/unit3compliance_400x400-80x80.png James Pawson2018-03-14 17:39:122018-07-13 15:29:32When is a Test Level Not a Test Level?